Victorian looks like a carriage with its wooden body, but hidden within is a simple drive mechanism for a gas-powered engine. It was built in 1900, not far from the Museum site, at Hopewell by furniture maker John MacArthur. 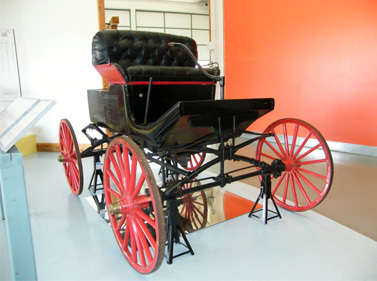 It was the first gasoline-powered car built in the Maritimes. MacArthur built it with carriage plans bought in Massachusetts and a two-cylinder, horizontally opposed gas engine (thought to be German-made) bought in New York. He built a frame of one-inch pipe, setting it on a set of extra heavy 30-inch wooden buggy wheels and attached the engine and simple, wooden body. The engine operated a jackshaft, incorporating a cone clutch, a band-type brake, and an open differential. Final drive was by flat belts from each end of the jackshaft to the rear wheels. The carburetor consisted of a piece of one-inch pipe in which dripping gasoline was vapourized by in-rushing air. The radiator was a tank with two-inch pipes for air passage and the car was steered by a tiller. The original belt-drive didn’t work well so MacArthur changed it to a chain and sprocket with a completely handmade chain. The vehicle’s top speed was 4-5 miles per hour and at even the slightest rise in the road it needed a push. The vehicle had many features in common with the first mass-production car, the 1900 Curved Dash Oldsmobile. They looked very similar and both had a chain drive with a tiller. The key difference: the Oldsmobile worked. Whatever dreams MacArthur may have had for mass-production were stalled by the Victorian’s less than stellar performance. Its combination of carriage construction and new gas-powered technology make it an interesting transitional experiment on the road to the age of the automobile.